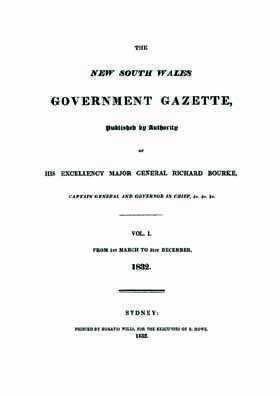 Government Gazettes are a unique, useful and extremely fascinating resource for local, family and social historians and researchers in other fields throughout Australia. They were published by the government as a means of communication to officials and the general public and therefore contain information that is of great use in establishing an image of the colony of New South Wales and its people in the past. They have information covering a broad spectrum of the community with important details and facts on thousands of people. In a New South Wales Government Gazette you will find tens of thousands of ordinary people and localities, small and large, are mentioned every year in Government Gazettes. You will find details on land transactions, court notices, notice of acts, tenders and contracts, police auctions of stolen property, statistics, unclaimed letters, impoundments of cattle and horses, reward notices and more. There is a huge amount of information (which include physical descriptions) relating to convicts including absconders, those who were granted tickets of leave and certificates of freedom, deserters, apprehensions and more. Government Gazettes contain a vast amount of historical and genealogical information. They offer researchers much more than simply names and places. They will help you reconstruct events and circumstances in the life of individuals and communities. A unique feature of the 1883 gazette is that it includes lists of all male convicts arriving in New South Wales month-by-month, together with name, convict number, ship, occupation, and often who they're assigned to, and where. For those with convict ancestors, if you had convicts in New South Wales during 1833, this really is a must!! Principal Superintendent of Convicts' Office, Sydney, 4th Nov. 1833. The undermentioned Prisoners having absconded from the Individuals and Employments set against their names respectively, and some of them being at large with stolen Certificated, and Tickets of Leave, all Constables and others are hereby required and commanded to use their utmost exertion in apprehending and lodging them in safe custody. Any Person harbouring or employing any of the said Absentees, will be prosecuted as the Law directs:Baldock William, 35, John Barry (1), London, Groom 5 feet 2 1/2, hazel eyes, dark brown hair, florid comp, from P. Elliott, since 29th October. Second time absconding. Brown George, 35, Ocean (1), Ceylon, Sailor, 5 feet 2, black eyes, black hair, black comp, from Moreton Bay, since 27th September. A repeated runaway. Carroll Thomas, No. 30-1943, 20, Hercules (3), Dublin, Labourer, 5 feet 0 1/2, hazel eyes, brown hair, ruddy comp, mermaid and shamrock on right arm, TM and cross on left arm, from Bathurst Bridge Party, since 12th Instant. This is a rare and invaluable genealogy resource for anyone exploring their NSW family history or building a family tree.